Today I'm concerned about undocumented immigrants who came here as children. Here in Texas, we seem to be most concerned about illegal immigrants from Mexico. It is not uncommon in Texas to hear of, or know someone who has been deported. In my past life as part of the public education system, kids of all ages, kindergarten through high school lived in fear that their day would come. I'm concerned about the children because many of them have no memory of what life is like in Mexico and some of them don't even speak Spanish. I'm concerned about the high school student who is doing so well academically and wants nothing more than to further her education. I'm concerned about the 22 and 25 year old adults who feel that even at a young age, their time has passed. They are destined to a life of menial work. Starting today, people who came to America as children and without proper documentation can apply to work legally. If the application is approved, it must be renewed in two years. This is definitely a good start. But it's only a start. While this could defer the fear of deportation for a while, those completing applications surely must be thinking, hoping and praying, lighting candles, fasting....what if President Obama is not reelected? 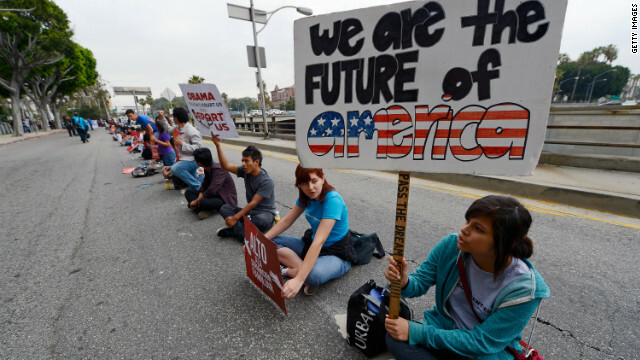 The DREAM Act failed to get enough support from Republicans to pass. This is an Executive Order made by President Obama. If Willard Mitt Romney is successful in his bid for presidency, he has been very clear that this Executive Order will not stand. America is a nation of immigrants. What if the Native American Indians had border patrol? What if they stopped Christopher Columbus at the border and asked to see his papers? I know that I'm over simplifying the issue, but at some point we need to apply common sense to this issue. It makes sense to allow a 25 year old who came to America at the age of 2 or 3 to work legally and pay taxes. We need the money, don't we? Don't forget to vote in November.